"Krailling near Munich, January 28th, 2008: Mass production in the Western world is on the brink of a silent revolution and e-Manufacturing is an important part of that change. These are some of the conclusions of a survey conducted by EOS at recent trade shows in Germany. EOS, the world-leading manufacturer of laser-sintering systems, interviewed industry experts at the K 2007 show in Duesseldorf and Euromold 2007 in Frankfurt." I doubt that many in the industry knows about the RepRap project yet. I’d say that 20% is still pretty strong support, and that’s for a 20 years time window. 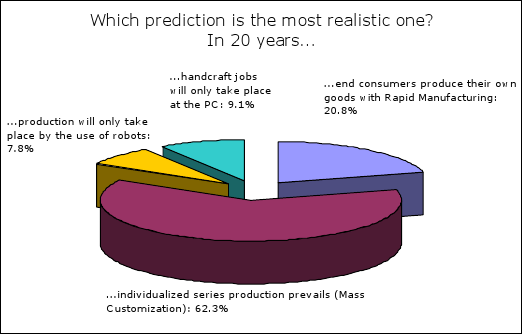 On the longer term I can only imagine (end user) personal fabrication having a higher market penetration/saturation.